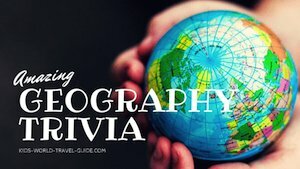 Here are some interesting South Korea Facts which were chosen and researched by kids especially for kids. Population: 51 million people live in South Korea (2017). The majority of the people live in the province surrounding Seoul in the north west of the country. Literacy: More than 95% can read and write. National Symbols: taegeuk (yin yang symbol), Hibiscus syriacus (national flower) and the Siberian tiger (national animal). The national colours are red, white, blue and black. 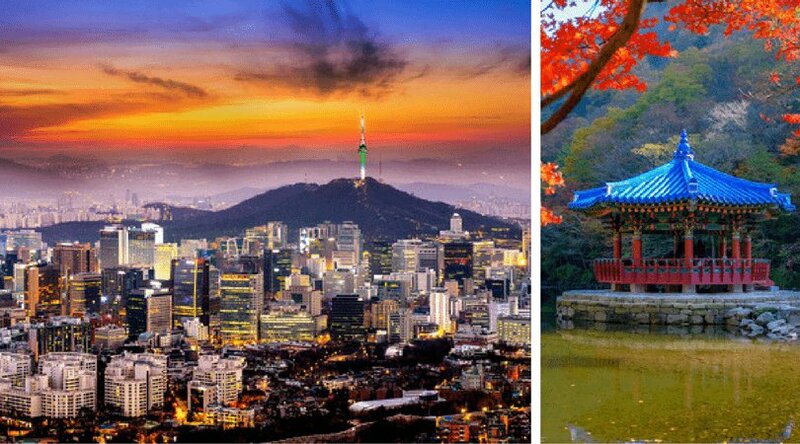 South Korea Facts: History: For many centuries, South Korea was an independent kingdom, but after 1905 the country was ruled by the Japanese. 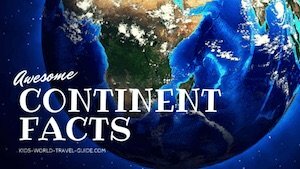 After Japan surrendered to the USA after the Second World War in 1945, Korea gained independence again, but the country soon was split between South Korea (which is largely supported by the USA) and communist North Korea along the 38 degrees latitude. Since 1953 South Korea's economy expanded successfully, while the people in North Korea are very poor and the relations between the two Koreas are very strained. 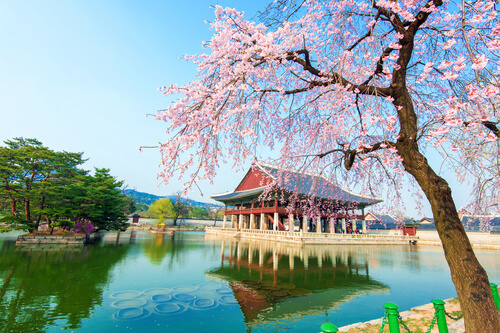 South Korea is located in Eastern Asia and sits on the Korean peninsula. The only land borders are with North Korea. 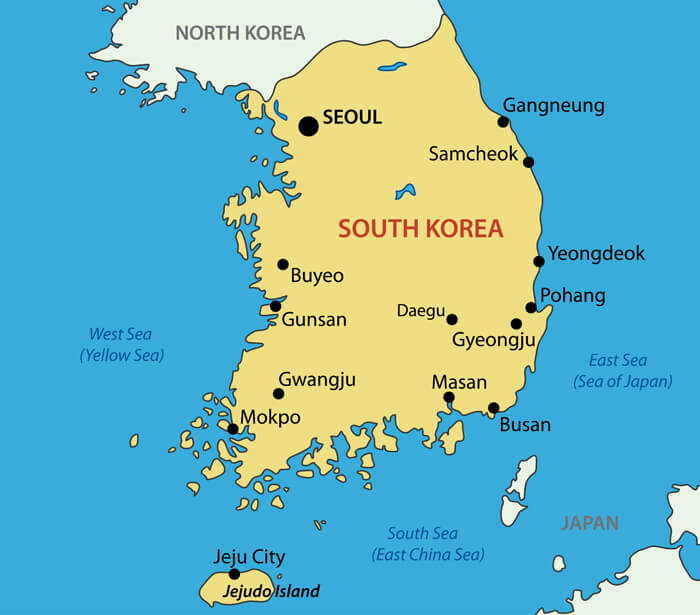 South Korea has a coastline of about 2,413km/1,500 miles length. South Korea is roughly the size of England or Portugal and about ⅓ of the size of Germany. South Korea is seven times smaller than Texas! The highest mountain of South Korea is the Hallasan with 1,950 m/6,400ft. 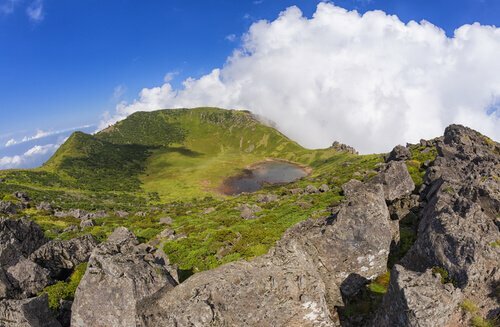 South Korea Facts: Hallasan is a volcanic mountain and this is an active volcano, however, it has not erupted in many centuries. The mountain is located on the island of Jeju. Jeju is the largest South Korean island and located to the south of the peninsula. 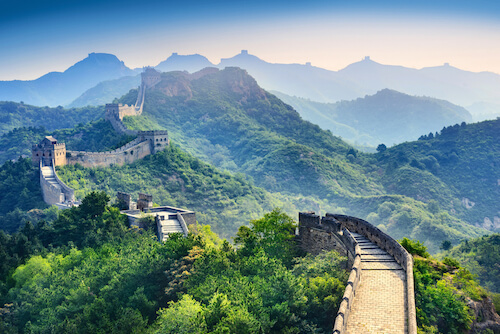 It has a moderate climate and is a popular holiday destination. There are more than 3,000 islands lying mainly around the southern and western coastline of South Korea. 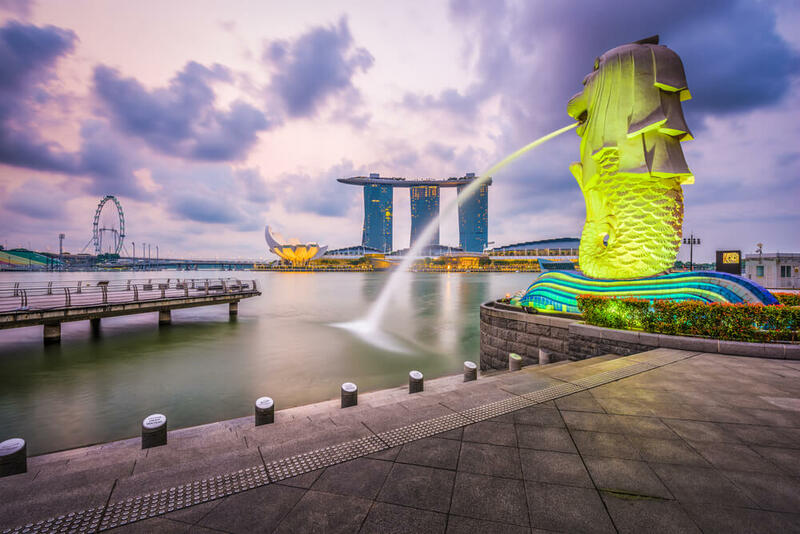 South Korea is one of the biggest economies in Asia and among the four 'Asian Tiger Countries' which also includes Singapore, Taiwan, Hong Kong. The main trading partners are China, USA, Japan and Germany. Big Korean companies are Samsung, Hyundai, LG Electronics and Lotte Group. The Lotte World Tower in Seoul is the highest building in the country and the fifth highest in the world. 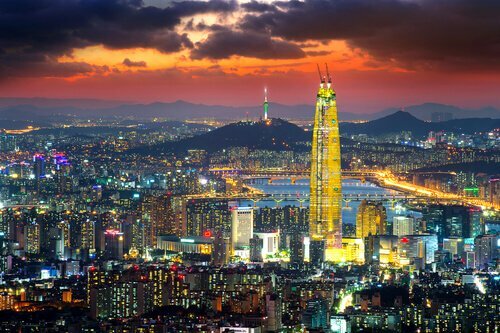 ﻿Seoul is the country's capital and largest city. It is situated by the Han River. A quarter of South Korea's population live in Seoul and the surrounding area. Myeong-dong, the main shopping district of the capital city, is a busy shopper's paradise with glittering lights and billboards. Bukchon Hanok Village, on the other hand, is the preserved old quarter and traditional Korean village you simply must see. Here you will also find Gyeongbokgung Palace. 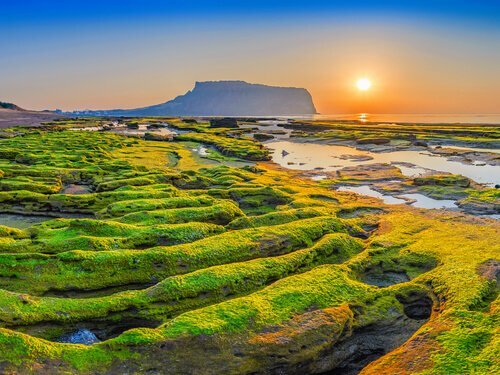 Jeju island is among the favourite Korean holiday destinations. 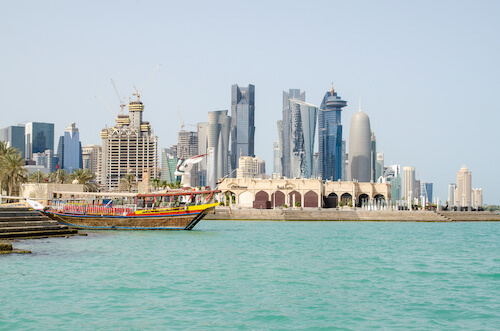 With a mild climate and numerous possibilities to go hiking in the mountains or lazing at the fabulous beaches, there are lots of activities for every family. Then there is Busan, a large port city in the southern part of the country. 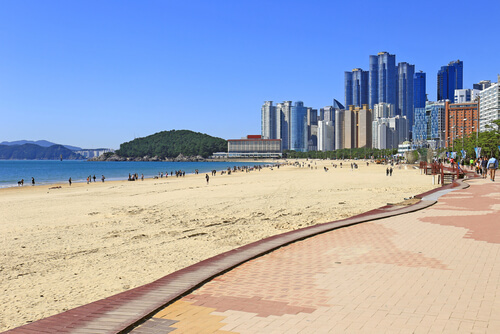 In South Korea's second biggest city, you can do your shopping and temple tours but also relax at some stunning beaches. And there you will be close to fascinating mountains too! 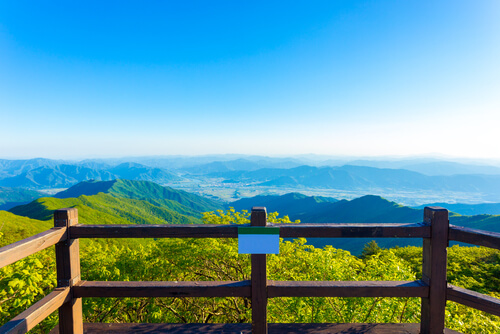 The national park surrounding Koreas second highest mountain Jirisan is only about three hours from the city of Busan. Another great place to marvel at nature is Seoraksan National Park for its breathtaking mountains with its snowcaps. 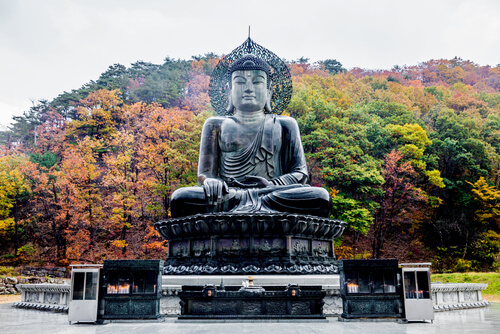 There is also the huge Great Unification Buddha statue which weighs over 108 tons and is 14.6 metres/48 ft. high. Then, of course, there is Pyeongchang. 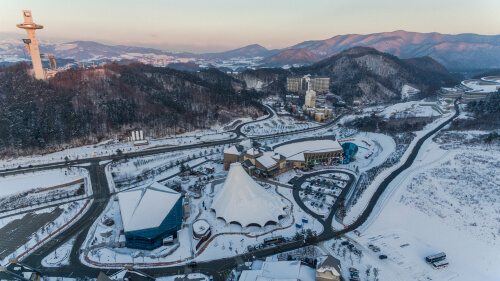 This is a winter resort in the north eastern region of South Korea. 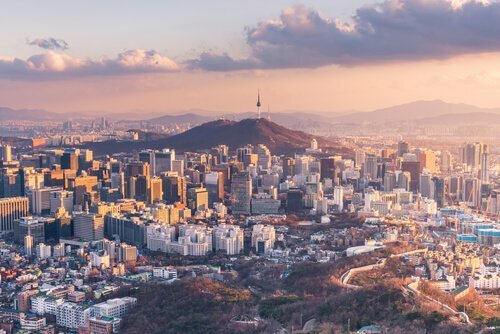 ﻿With the winter olympics 2018 in town, this place is certainly one of the top South Korean destinations to visit this year. This winter holiday resort has all kinds of sports activities to offer and accommodation options are varied and plentiful - after the winter games. 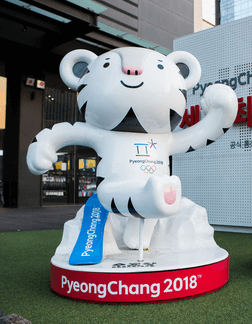 Did you know that the Olympic mascot, a white Siberian tiger, is called Soohorang? 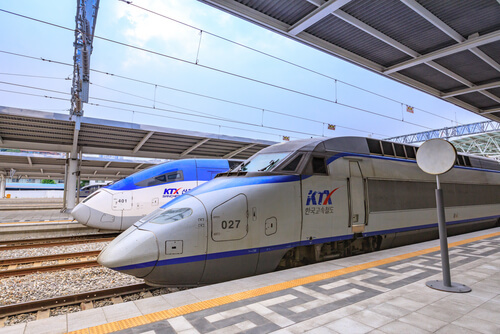 People who visit Seoul can travel to Pyeongchang via the Korean bullet train. 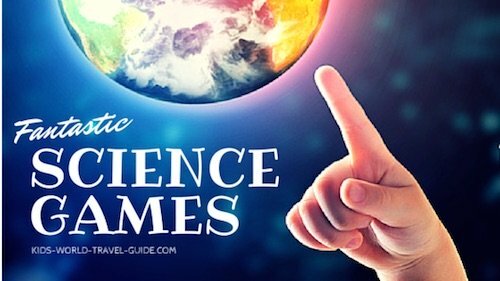 Do you want to know more about the Olympics in South Korea? Read on here. Most Koreans live in urban areas of the country. The biggest cities are the capital Seoul, Busan (Pusan), Incheon (Inch'on) and Daegu (Taegu). South Korea is one of the most technologically advanced countries and the educational standards are high. The people in rural areas are still much poorer and many live a simple life. 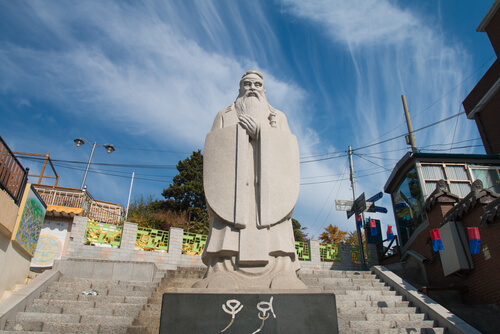 Many Koreans practise Confucianism which is an old tradition in many Asian countries. Confucianists follow the teachings of Chinese teacher and philosopher Confucius who told his pupils to lead a simple life, do good and respect each other. Koreans celebrate the new year twice! The New Year celebration are on 1 January as most countries do and for Lunar New Year which is celebrated in February each year. 2017 was the year of the rooster, 2018 will be celebrated as the year of the dog. Which zodiac sign are you? Find out here. Children look very much forward to the Lunar New Year celebrations which are two weeks long celebrations over the new year when they get gifts, often money wrapped in red envelopes or red packets, from family and friends. 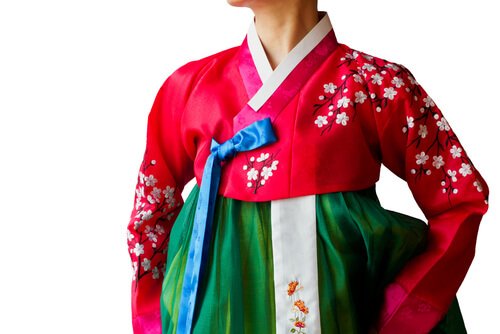 People in Korea will wear their traditional costumes, such as the hanbok, for national and regional cultural festivals. Korean pop music, also called k-pop, has become famous worldwide especially after PSY's 'Gangnam Style' YouTube hit in 2013. 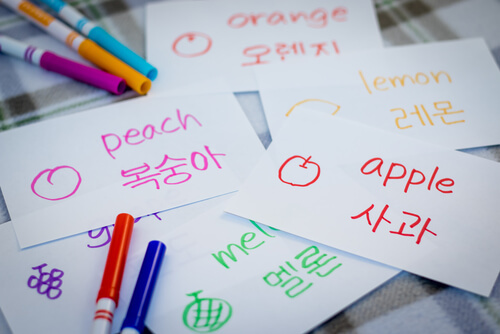 Although Korean (also called Hangul) is the official language, in many regions people speak Korean dialects. Children learn Mandarin and English in schools and most people speak English fairly well. The Korean alphabet has 24 letters and the language does not have any articles and does not follow a word order. The language is similar to Mandarin and Japanese and is written and read from top to bottom and from left to right. Korean is the language of both countries: South Korea and North Korea. Apart from using a slightly different accent and some dialects, the Koreans can understand and communicate with each other. 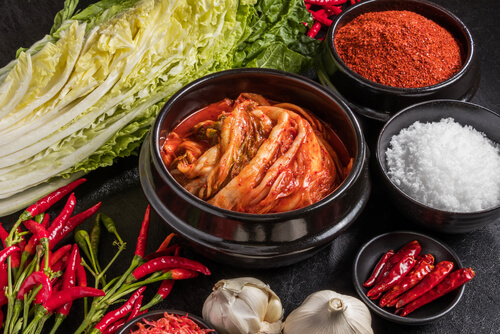 Many Korean dishes are rice, vegetable, soya and meat based. Jajangmyeong: very popular street food consisting of noodles, vegetables, fried pork or seafood in a thick black bean sauce. 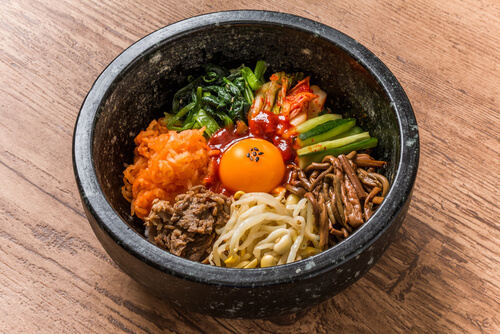 Bibimbap: mixed rice with four to six different vegetables and often served with an egg that might be fried and sunny side up or raw as is shown below. 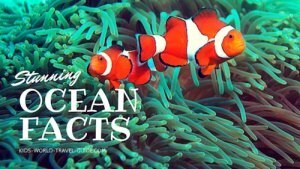 There are many endangered animal species living in South Korea. 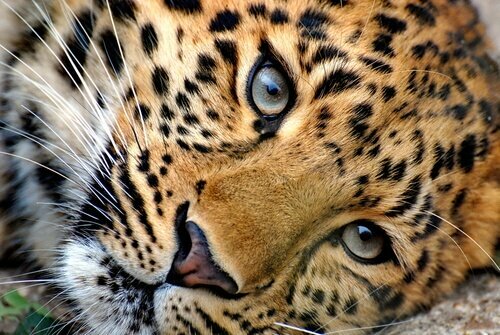 Among them are the Siberian tiger, the Amur leopard, the golden eagle, the lynx and the Siberian musk deer. 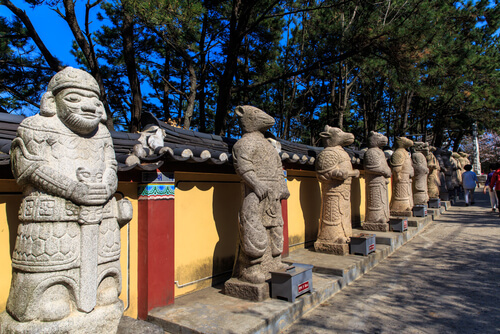 Below you see animal statues at Heading Yonggungsa temple in Busan. These animals depict the twelve Zodiac signs. Great resources to learn more about Chinese New Year can be found on this site. 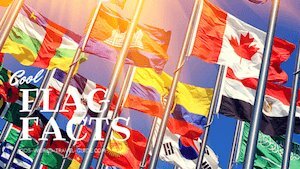 The informative and well laid out website is written and maintained by a Chinese expat and her children and gives also comprehensive information and important China facts. 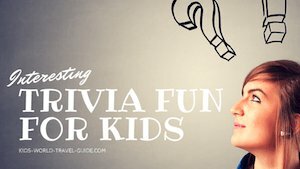 Please bookmark our page if you are interested in South Korea Facts for Kids as our South Korea for Kids page will be updated regularly. Feel free to contact us if you or your school would like to join in our schools project. Looking forward to hearing from you!